Launched at the 2015 Geneva Motor Show, the 488 GTB opened a new chapter for Ferrari, one in which Maranello’s entry-level supercar uses a turbocharged engine. A newly developed, 3.9-liter V-8 replaced the naturally aspirated, 4.5-liter V-8 of the 458 series, making the 2016 488 GTB the second modern Ferrari to go the turbo way, after the 2015 California T, which was the company’s first vehicle to use forced induction in more than two decades. Design-wise, the 488 GTB remained true to the styling introduced by the 2010 458 Italia, although some body parts were heavily redesigned. Some cues from the LaFerrari and the classic 308 GTB are also visible. 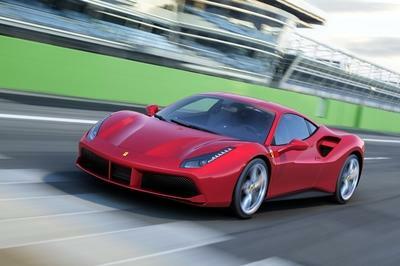 The 488 GTB also represents a huge leap forward for a Ferrari entry-level supercar in terms of performance. The updated aerodynamics and drivetrain make it significantly quicker than its predecessor, and as quick as the beefed-up 2014 458 Speciale from 0 to 62 mph. The 488 is also impressively nimble on the track, lapping the Fiorano course faster than any other Ferrari but the insane 2014 LaFerrari. Impressive doesn’t even begin to cover it! Now that Ferrari has unveiled most of the details and performance specs of 488 GTB, it’s time the supercar heads toward dealerships to replace the 458 Italia. Pricing is still a mystery, but until the actual figures roll in, Ferrari fired up the car’s online configurator for gearheads — Ferrari customers or not — to enjoy. 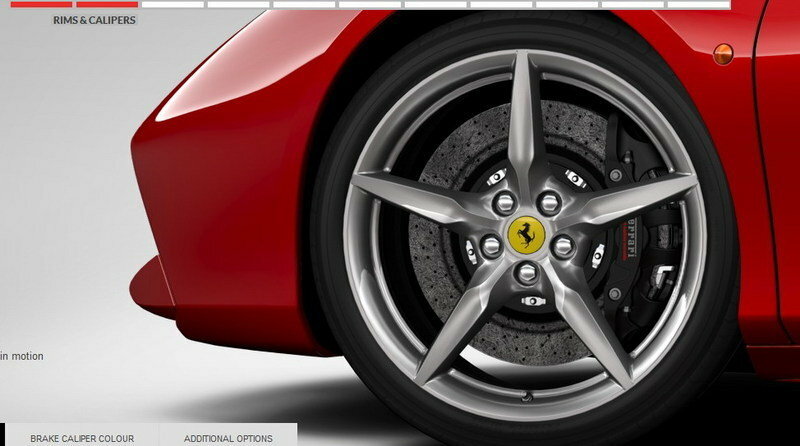 Continue reading to learn more about the 2016 Ferrari 488 GTB’s configurator. As with all Ferraris except the range-topping LaFerrari, the 488 GTB can be had in a wide range of exterior colors. There are 26 hues, although most of them are different shades of red, gray and blue. As always, the palette includes Maranello’s historical colors, such as Giallo Modena, Rosso Corsa, Rosso Fiorano, Grigio Ingrid, Nero Pastello and Blu Tour De France. Customers that want something a bit more exotic can pick from the orange-like Rosso Dino, Avorio, Verde British, Blu Abu Dhabi or Azzurro California. 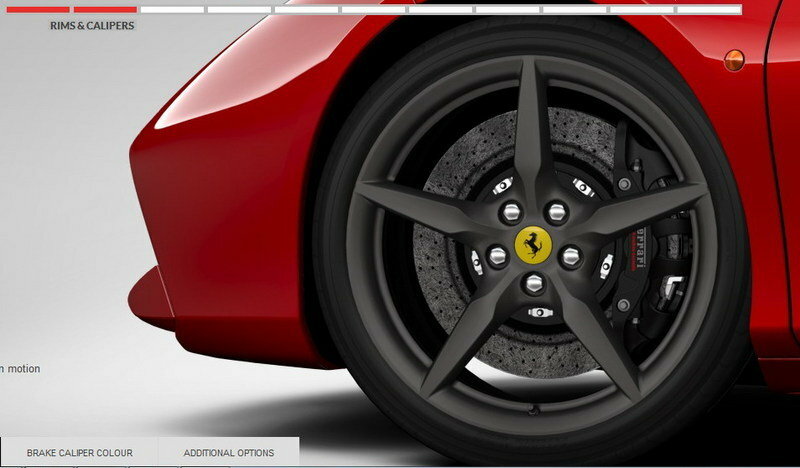 Of course, more colors are available via Ferrari’s customization program for a not-so-nominal fee. 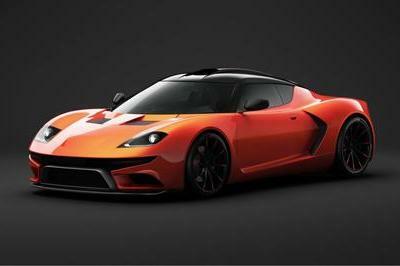 All body colors can be combined with a Nero Pastello roof for a two-tone exterior combo. Once you’ve figured out the color of your 488 GTB, it’s time to move on to body components. 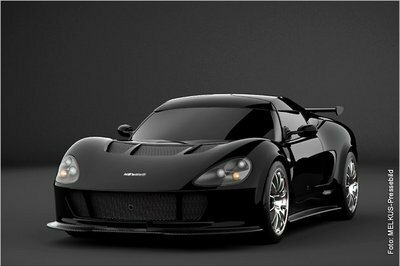 This section give you the option to add an array of carbon-fiber parts, such as a rear diffuser, rear bumper light surround, or underdoor cover. 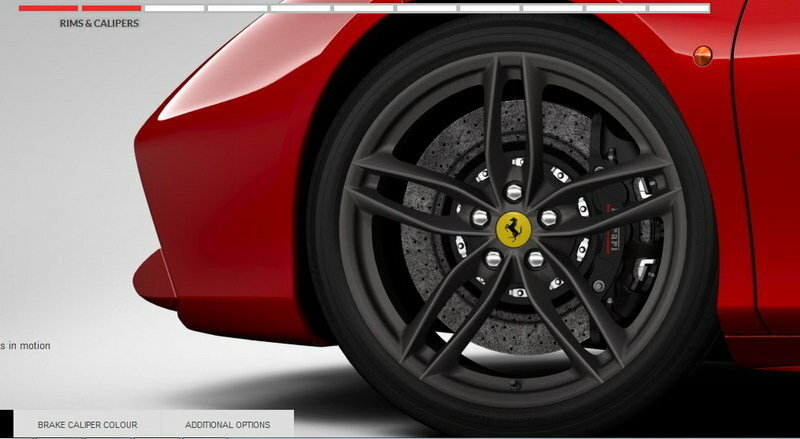 "Scuderia Ferrari" shields for the front fenders are also available in this section. Additional exterior options include anti-stone chipping treatment for the paint, front bumper protection film, and sport sill covers. 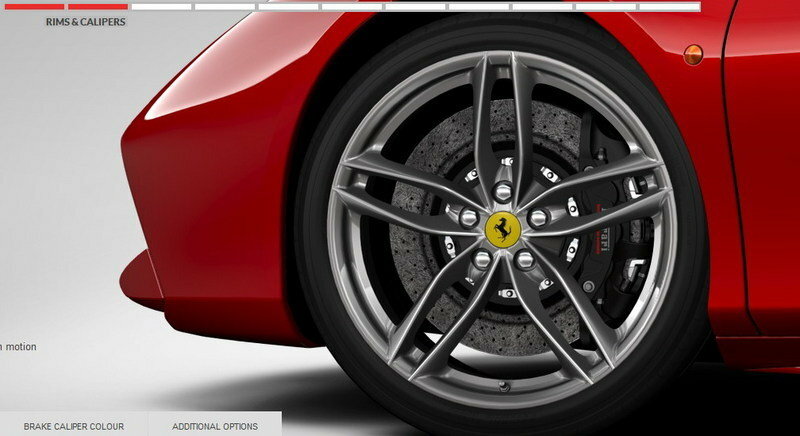 Moving over to the wheels, the standard 488 GTB is equipped with a set of silver five-spoke rims. 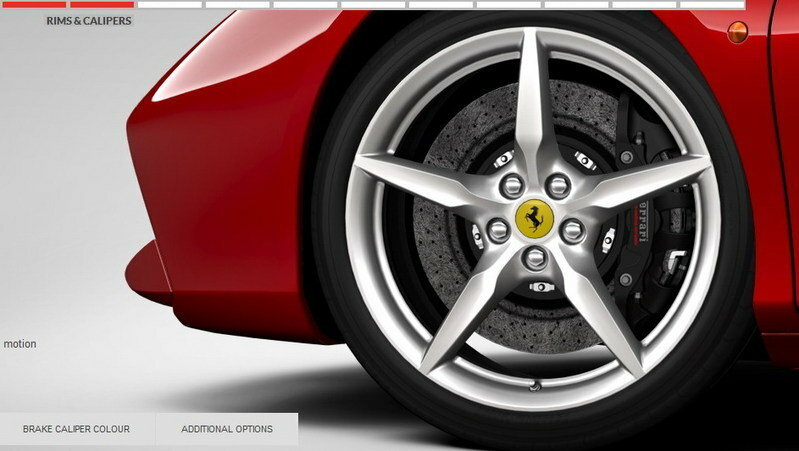 The same wheels can be had in either chrome or Matt Grigio for an extra fee. 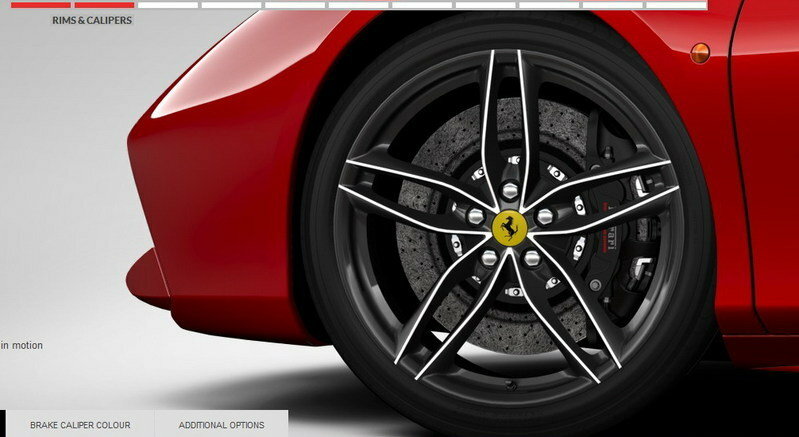 There’s also a five-twin-spoke, forged rim option in either chrome, diamond or dark gray. The palette is equally varied for the cockpit, with 15 configurations to pick from. Darker combinations feature various shades of grey, blue and brown, while brighter interiors are available with Rosso Ferrari, and cream or beige hues. Crema, Sabbia, and Beige Tradizione provide the strongest contrasts, while Nero and Charcoal are the darkest tones customers can combine. You’ll likely spend a lot of time selecting the stitching, as there are no fewer than 34 options available. 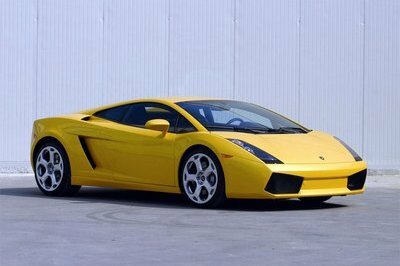 Same goes for the carpets, which can be had in any color from yellow to red or blue, with or without Ferrari logos. Plenty of options to choose from in the seating department as well. Besides the standard seats, Ferrari offers four optional designs, two of which are racing units. 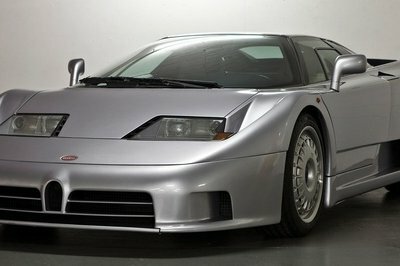 Other options include carbon-fiber inserts for the door panels and dashboard, colored rev counter, carbon-fiber center bridge and tunnel trim, and a smoking kit. The accessory list, on the other hand, is limited to a trolley/soft bag/suitcase set, a fire extinguisher, a telemetry kit, a silver dedication plate, and a high end audio system.